Roadsides, fields, disturbed places, clearings, banks and bluffs, shores. First collected in 1882 in Mackinac Co. but established at a number of places across Michigan by the 1890’s. The species has an unpleasant odor. 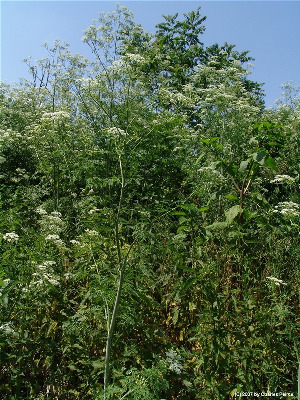 It can grow to 2 m or even more in height; the purple-spotted, slightly glaucous stem, lacy foliage, and white umbels make it very conspicuous. Although toxicity varies among plants and with the season, as well as the part of the plant, this is a very poisonous species, promptly producing symptoms when ingested and often death from respiratory failure. Both livestock and humans are affected. Socrates is the best known victim of poison-hemlock. MICHIGAN FLORA ONLINE. A. A. Reznicek, E. G. Voss, & B. S. Walters. February 2011. University of Michigan. Web. April 26, 2019. https://michiganflora.net/species.aspx?id=116.